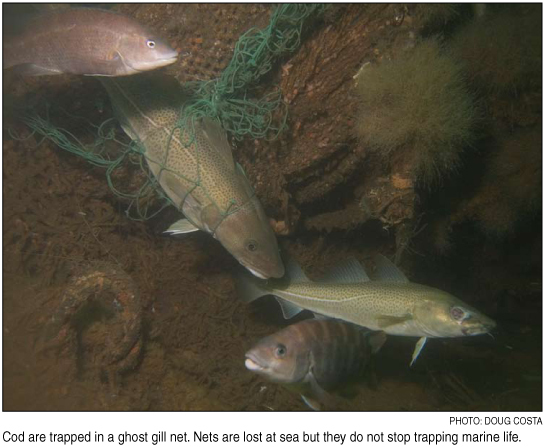 Derelict gear out in the ocean is called “ghost gear” because it continues to catch marine life even though no human is actively using the gear. The gear continues fishing for years and catches marine mammals, seabirds, fish and invertebrates, and also catches healthy predators that come to feed on the decaying organisms that have been caught. Gear can also smother habitat if it drifts to the ocean bottom. Additionally, derelict fishing gear poses a big problem for fishermen, who can get entangled in it while navigating their boats. Fishermen can also spend hours in a season untangling their gear from ghost gear, amounting to many hours of lost fishing time. In Puget Sound, Washington, U.S., a hot spot of activity in the U.S. for recording and removing ghost gear, the Northwest Straits Initiative removed 939 gillnets, in which they found 35,930 live and dead animals including 22 dead marine mammals, 378 dead birds, 1,022 live and dead fish, and 29,517 live and dead invertebrates. Without hard statistics like those available in Puget Sound, it’s hard to know exactly how much of this kind of debris is in the Gulf of Maine and how much damage it’s doing. The nonprofit group Stellwagen Alive would like to find out. This organization is coordinating groups in the Gulf of Maine working on addressing the ghost gear issue, with a focus on collecting scoping and assessment information, such as the amount, type and location. A challenge added to this lack of regional information is the complicated set of legal issues that surrounds the retrieval and disposal of derelict fishing gear. Laws regard the gear as private property, and as such it cannot be removed by anyone but the owner without special permits. Stellwagen Alive Director Jennifer Bender Ferre is casting a wide net to build the strongest networks and partnerships possible to create solutions to derelict fishing gear issues. More than 30 organizations were represented at a regional derelict fishing gear workshop hosted by Stellwagen Alive in November at the New England Aquarium. Attendees were from academia and research institutions, the commercial fishing industry, nonprofits and federal and state agencies. Objectives of the workshop included disseminating information about the implications of ghost gear, bringing to light the regulatory barriers surrounding its retrieval and removal, and forming a regional effort to work together on solutions. Three working groups that emerged from the meeting are looking at how solutions can come to fruition in the Gulf of Maine. 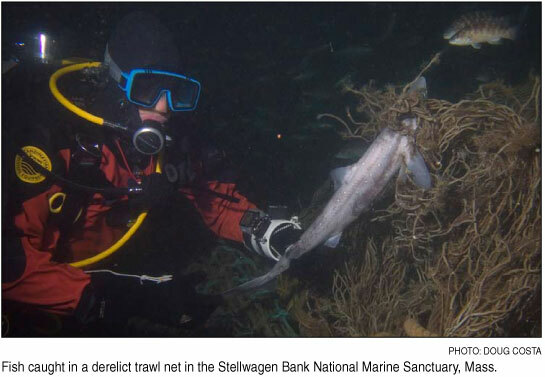 A commercial fishing liaison with the Stellwagen Bank National Marine Sanctuary further helps provide a link to the fishermen in the planning and scoping efforts to find these solutions. In partnership with the Provincetown Center for Coastal Studies, Stellwagen Alive is collecting information on ghost gear for a mapping initiative. 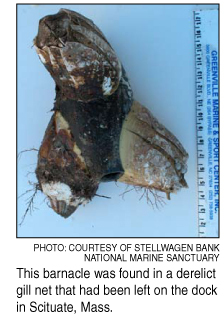 To report debris, visit Stellwagen Alive’s web based reporting form. In addition, if you have conducted scoping studies or know of existing studies in the Gulf of Maine, please get in touch with Stellwagen Alive at (617) 522-1838 or jennifer@stellwagenalive.org. For more information about marine debris and removal projects in the United States, visit NOAA’s marine debris page.